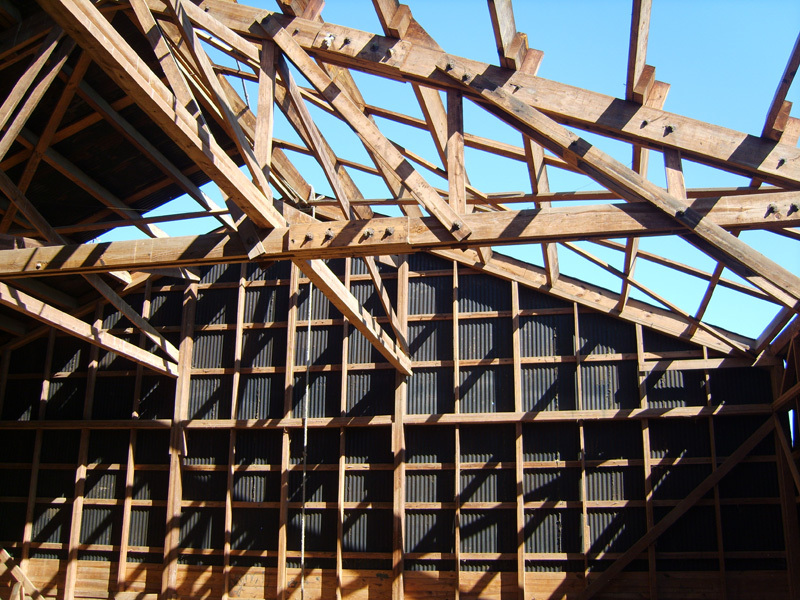 Through the years we have been involved in reclaiming hand hewn beams from older structures built prior to the 20th Century. 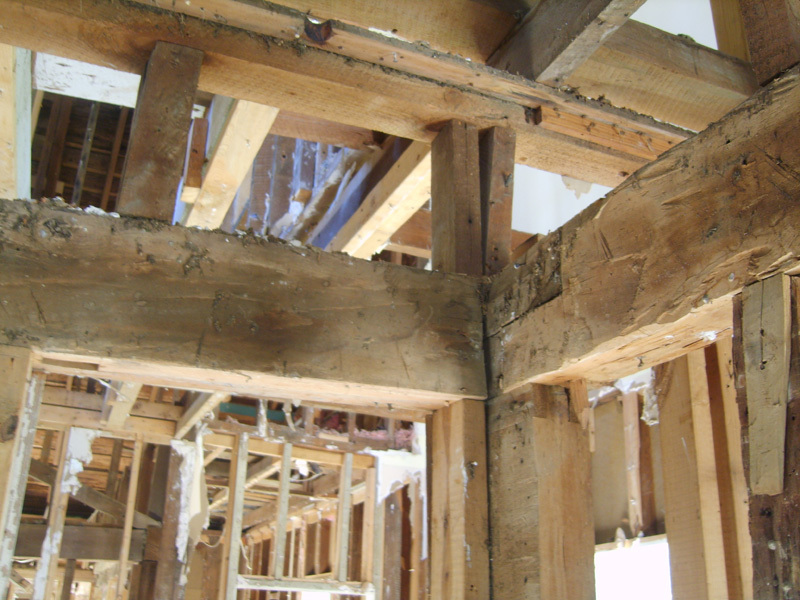 We here at VINTAGE FLOORING & FURNITURE try to maintain a good supply of these beams. 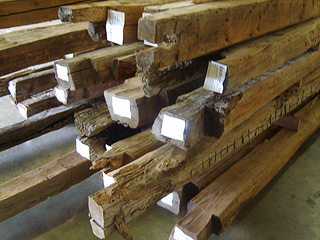 Currently, our inventory includes some Hand Hewn Beams about 200 years old. 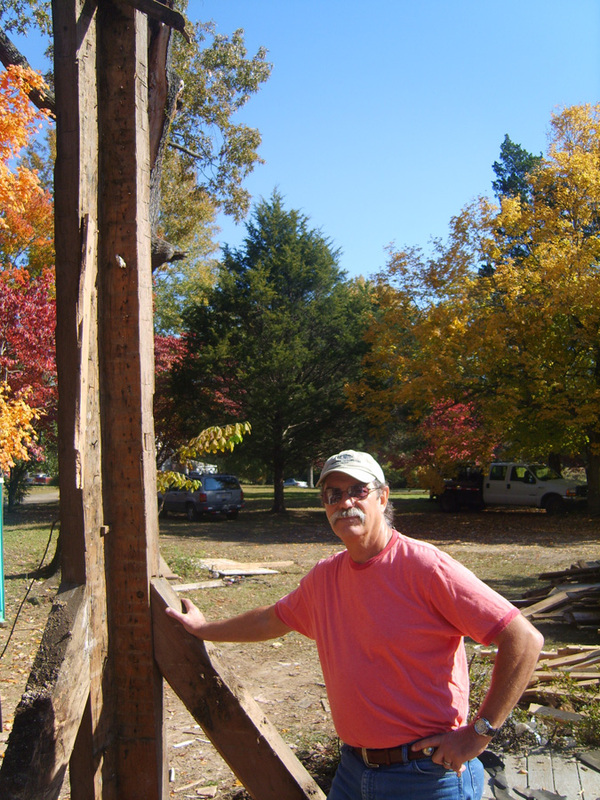 They make gorgeous additions to any structure and make beautiful mantels that are truly a conversation piece. Most of these structures were log cabins built by pioneering settlers that had an unshaken will to make it in an untamed land. Their determination was, in most ventures, fueled by a deep faith in God. Always, there is an interesting story attached to the place. It is fortunate for us when we can work with folks that have known and recorded the stories in their family records. 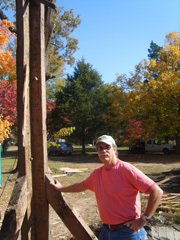 My favorite of all was told to me by an elderly fellow who invited us to come and see if we could use the material from a log cabin located on the family estate in Red Banks, Mississippi. The old gentleman was about 80 years old as I recall. One rainy day about 30 miles away from the cabin, we were working on an old house and had to stop work when the rain became severe. 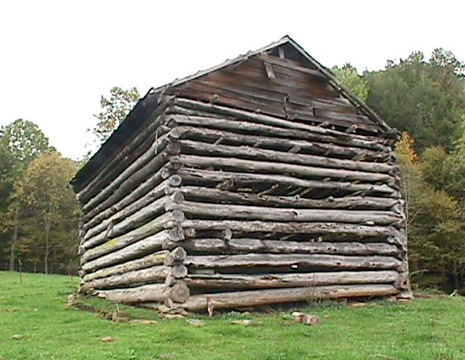 I decided it was a good time to drive over and inspect the log cabin we had been invited to see. We meet the owner at a shopping center parking lot and then drove out to the property. As we were standing inside the cabin raking away the cob-webs and looking around with great interest, Mr. Bell begin to tell us the history associated with his cabin. It was here his Grandfather was born. “See where the wood is splintered ‘round that door latch over there,” he said. It was oblivious looking at it that the main door had once been forced open causing damage to the door. “ Well..,” he continued, that’s where Union Soldiers during the (UN) Civil War kicked the door in when my Great Grandpa and Grandma lived here.” After a spit n’ wipe, he went on with his story reminding us this wasn’t no yarn, (was the truth) “Yes sir, them Yankees came right in and a perky (?) Lieutenant told my Grandpa and Ma that they were going to take half the chickens in the hen house and that old mule in the barn.” At this time Mr. Bell starts acting out the part of GGrandma and raises his voice a few octaves(that’s a little louder) “You take all them chickens you want you young whipper snapper(? ), but you leave that mule alone,cause he’s mine and you ain’t gettin’im !” she screamed at the officer. Obliviously the Union Lieutenant had to feed his hungry men but the responsibility did not diminish his compassion on the family needing that mule to farm with, however, they had a heavy cannon outside that the soldiers were laboring to pull and it was slowing them down. Feeling sorrow for Grandma in taking her mule, the Lt. reached in his coat pocket and took out a gold watch. “Mam,” the officer spoke softly,”Calm down, I’m sorry but we’re going to take that mule and you take this watch, I hope it’ll make you feel better”. Grandma yelled “He goes by Jumper, but I’ll warn ya, he’s stubborn and ornery”, as the men quickly left the two room cabin. Outside there was quite a ruckus (lotta stuff going on) as they gathered the chickens, hitched ol’ Jumper to the cannon and headed south. Then Mr. Bell gave us the best part of the story and this is how it ended. About two hours after the soldiers left, Grandma heard a sound outside the cabin door. Going out to investigate, to her delightful surprise, yep, you guessed it…there stood Grandma’s mule. Old Jumper had found his way back home. At this point ,our story teller grinned n’spit n’ wiped all in one motion and exclaimed,” We still got that gold watch in the family, follow me back to the house and I’ll show it to ya!” We didn’t have the time, but oh how I was amused at what we had seen and heard. As I was retiring that night, I just couldn’t get the story off my mind. Ol’ Jumper proved to be more than the soldiers could handle. His stubbornness and ornery spirit freed him to find his way home…and he knew where home was. It made me think about an Eternal home that awaits those whose stubborn and ornery faith in God was too much for the world to handle. They refused to be conformed to a CHARACTER that was unlike their Lord and at last, breaking free, they too, like ol’ Jumper… find their way home. 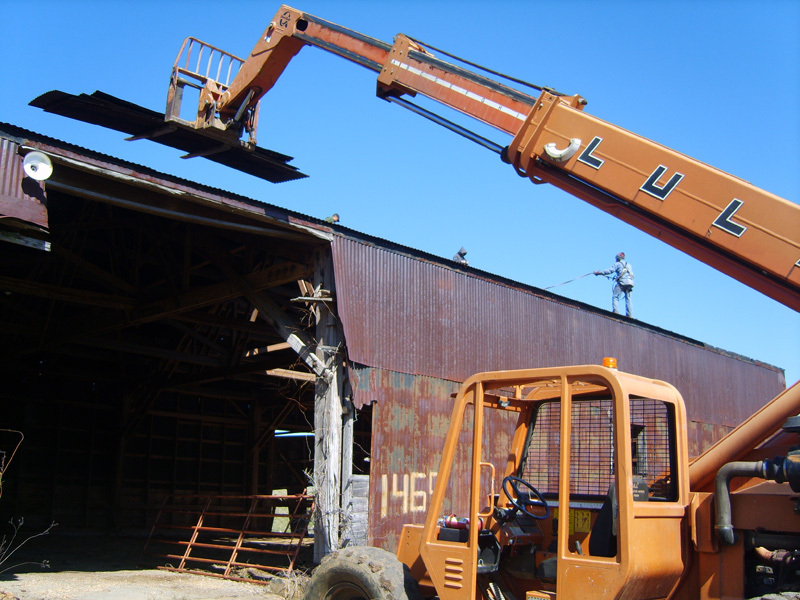 We were called on to check this barn out a few years back. It was located in central Michigan. Arriving on a beautiful early fall day, I was mesmerized by the view it provided as it sat among the country side. 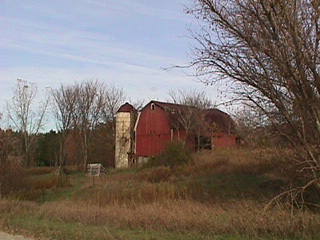 It was built around 1900 by the Amish. Often as many as 300 men would show up at sunrise and begin working on the construction and by sundown it was finished and ready for use. They were usually very large. This one had a bottom level for milking cows, and two levels above it. The top was where the hay was stored and it was there that this old Mississippi boy first got suspicious of the tall cows of Michigan. It had posed a liability to the owners who were having difficulty obtaining insurance for their home due to its proximity and it had to come down. This seemed reasonable especially since they had no use for it. 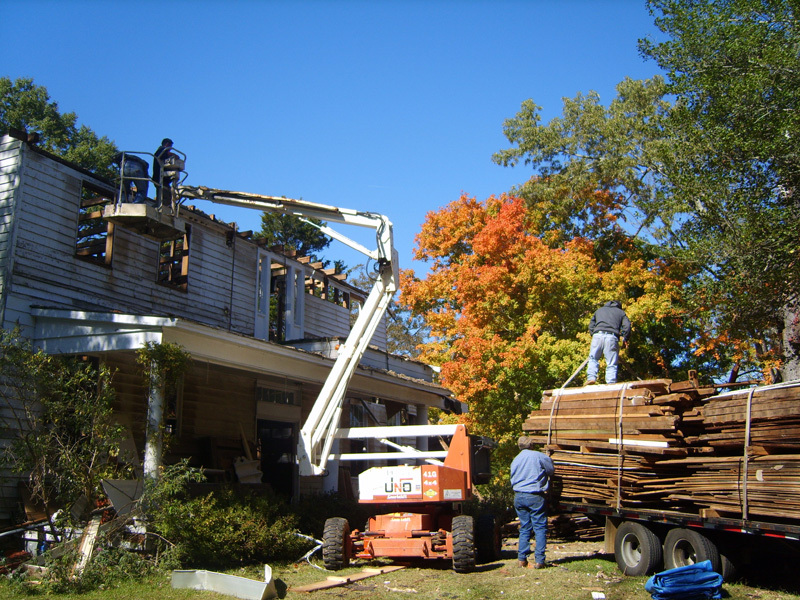 Having contracted with the owners, we began the tedious process of removing each board with lots of TLC. Beginning on the roof, we fast came to the hay loft and there I found my first clue to these strange cows that were raised up there about a hundred years ago. We started finding dried... and I mean dried, cow manure all over the loft floor. Being the inquisitive kinda fellow my mama always told me I was because I ask to many questions, I began to ask myself, "how did all this cow manure get way up here in the hay loft? "Right away I figured somehow the cows got up there but that didn't puzzel me as much as how tall they had to be. You see, there was a line of dried manure all along the top of the wall which was about a foot over my head. Now them cows the way I saw it had to be a good taller than a man and that ain't all. They were all smart enough to be trained to turn their butties toward the wall every time they had to go. I was amazed by it all... but I soon became un-amazed. When I brought the subject up with an elderly Amish fellow and began to ask all those questions mama warned me about, he just laughed and explained that in the old days they stuffed fresh cow manure around under the eve of the roof as a seal to keep the wind out. Well... that sounded strange to me, but I guess it makes more sense than 7 foot cows... that might could fly? This house is not even close to being our largest project but does rate on top as one of the most interesting. 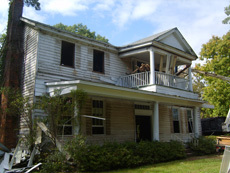 The house was built by slave labor in 1844. It was the second oldest house in the county where it was located. Built by Joel Pinson as a wedding gift to his daughter. (Whoa! ...why don't they still do that?) Sam Houston and Joel Pinson were the best of friends. They both hanker'd to court the same lady of choice. The hankerin' got so intense that one challenged the other to a duel, the one left alive gets to date her. They proved to be men of high honor when they turned and fired... both purposely shot in the air. Sam took the lady but as I understand the record, the courtship didn't last but the friendship between Joel and Sam did. 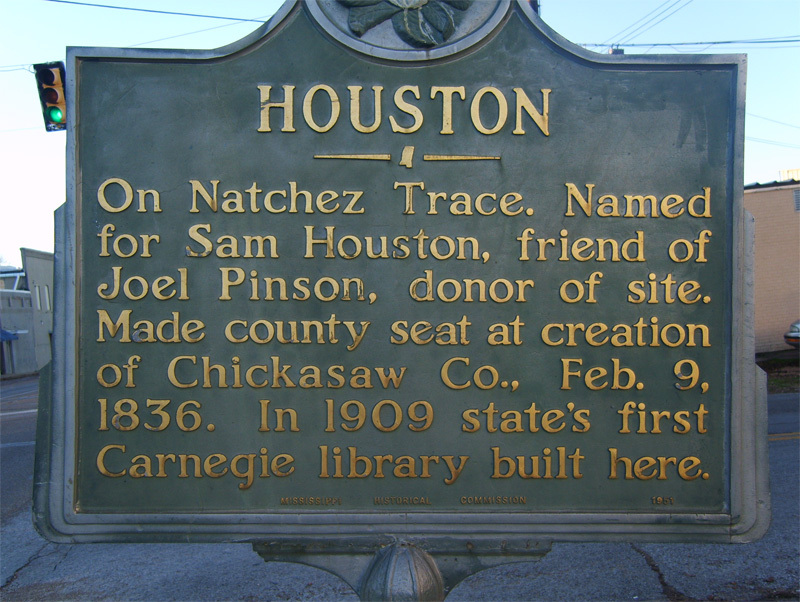 Joel even donated a plot of land for a township with the understanding it wood be named after his friend Sam Houston. During the ( un ) Civil War the house was raided by Union soldiers looking for food. In a frantic hurry, while the yanks knocked on the door, finally kicking it in, the Hams and Bacon slabs were hidden over the door transom. That was one night the yanks didn't bring home the bacon. 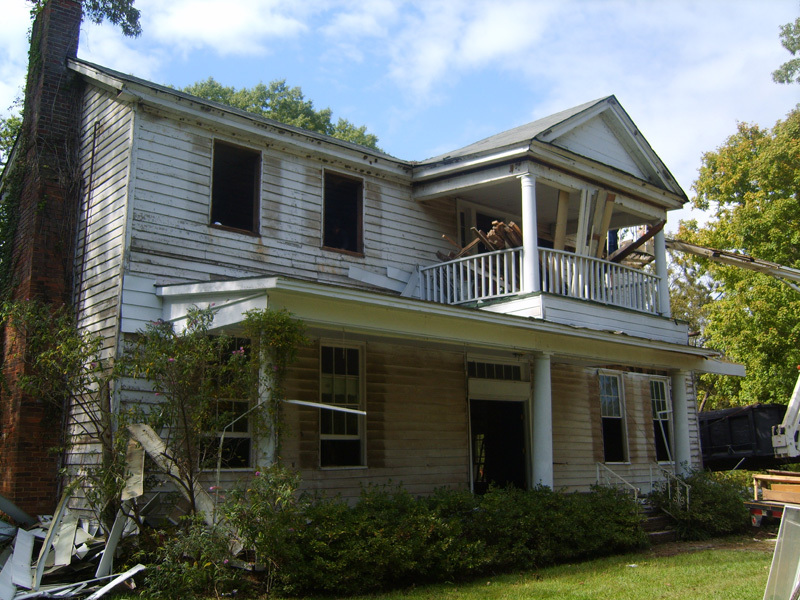 The stately old house was hit by a tornado about 4 years ago and damaged beyond repair by a large oak limb that fell across one corner and crushing into an upstairs bedroom. The limb was estimated weighing around 7000 lbs. It came to rest on the very bed the occupant of the house slept in. The fellow is still thanking the Lord for looking out for him. He was out of town on business the night the storm hit. We purchased the house from two sweet elderly sisters that were so happy it didn't go to waste. One of them loved to watch the men work, handling each board with the upmost of care. 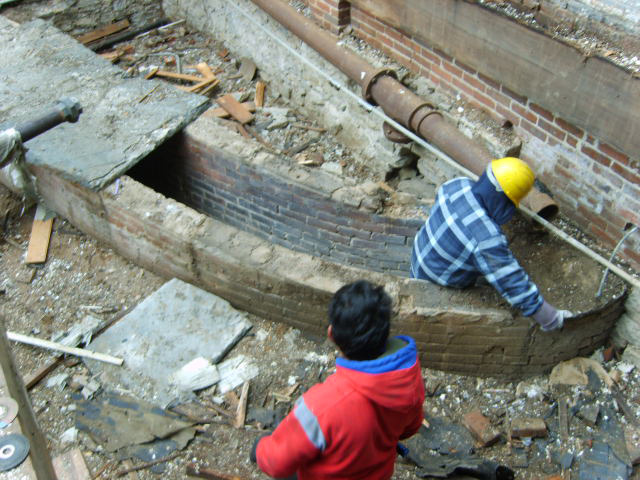 Almost finished with the dismantling, we had gotten down to the bottom floor joist. In her late eighty's, the dear little lady began to shout, "There!, There they are!" Running over to her, I was afraid we had uncovered a den of Copperheads. It happens sometimes. "What is it? ", I yelled. 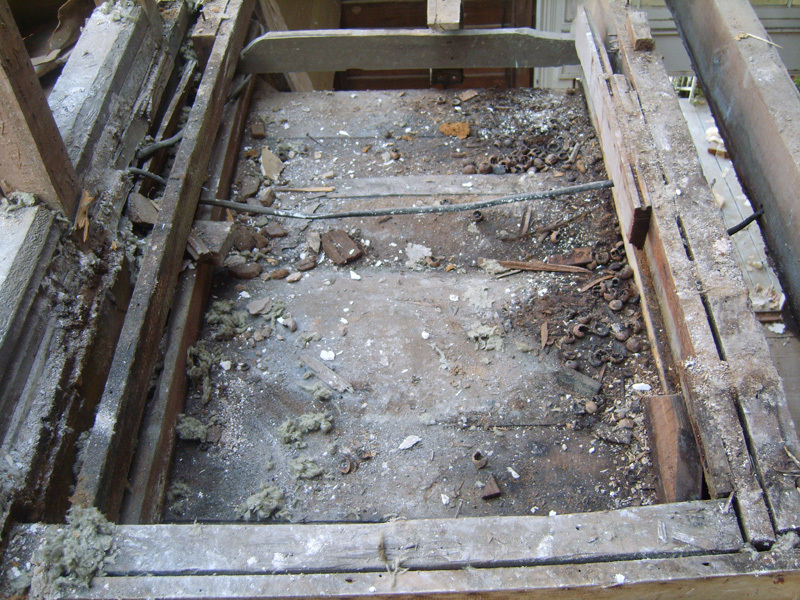 Pointing down at the floor joist she exclaimed "Those boards right there! ", That's what I kept banging my head on as a little girl when my mama made me scoot under the house and gather hen eggs!". I smiled, took her by the hand and lead her over to them and we sat down on one of 'em. She just sat there a moment, looked over at me, smiled back and gave me a hug. It made me feel real good. This old house born in 1844... still lives on, bringing joy and happiness to others. Some of this material has ended up in a beautiful home on a ranch out in Oklahoma. The GOP nicknamed the “Bullet Plant” was an economic life saver for the rural area around Prairie, Mississippi which was still suffering from the Great Depression of “33”. It was credited as being a major thrust in the success of the war effort against Germany and Japan from 1942 to 1945. The huge munitions plant was a massive undertaking for Procter & Gamble the plants contractor and manager. The larger caliber ammo made here included 20, 40, 57 and 75 mm shells. There were also production lines producing 4.5” rockets and 100 lb bombs… by the hundreds of thousands. 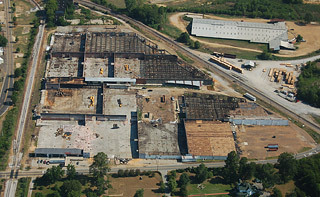 The plant was located on 6,720 acres with over 27 miles of railroad running through it. Operating 24/7, it was Mississippi’s second largest employer with 10,000 employees at its peak operation. 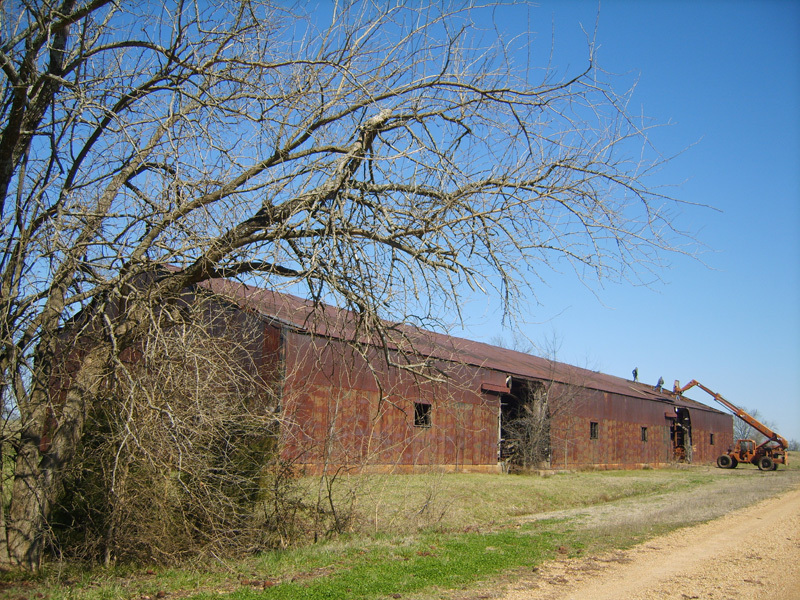 Sometime after the war was over the entire land and improvements were donated to Mississippi State University and turned into an Agriculture Experiment Research Center - which has been instrumental in aiding farmers and ranchers around the world. Among the many buildings were 16 large Finished Ammunition Warehouses of which over half were of no use to the university. 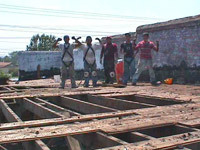 That’s where Vintage Flooring and Furniture came into the picture. 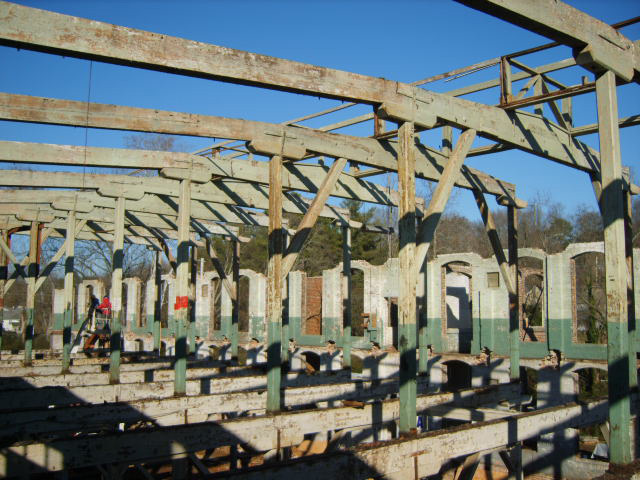 Over the years we have dismantled many of these buildings. The Government bought the best lumber and tin that Government money could buy and that’s usually over the top if you know what I mean. We are still producing beautiful hand crafted furniture and flooring from these warehouses. Truckloads of flooring grace beautiful homes all over Phoenix, Arizona and the Rustic Brown Tin can be found on homes, clubhouses and lodges as far away as Montana and the Dakotas. I realize the Gulf Ordnance Plant brought many people out of acute poverty in its day. 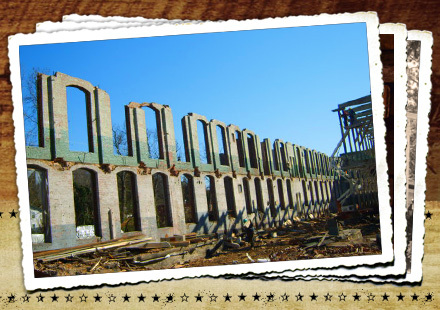 However, In telling this story, I’m reminded that these buildings were originally constructed to house weapons that resulted in much pain, sorrow, misery, and lives lost, that only Eternity can truly tell… but now, they are being used to bring happiness and joy to people all over the country. The irony of it all causes me to think deeply about life and somehow calls my heart away to another time, another place where… all things have become new. 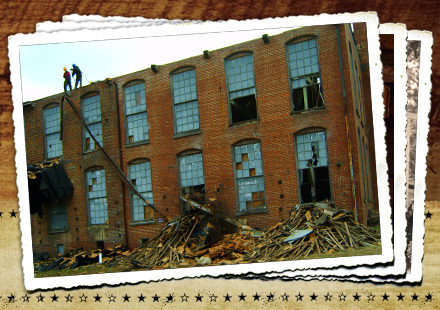 The lumber we reclaimed from this old cotton mill in North Alabama has been around… and I do mean, been around. 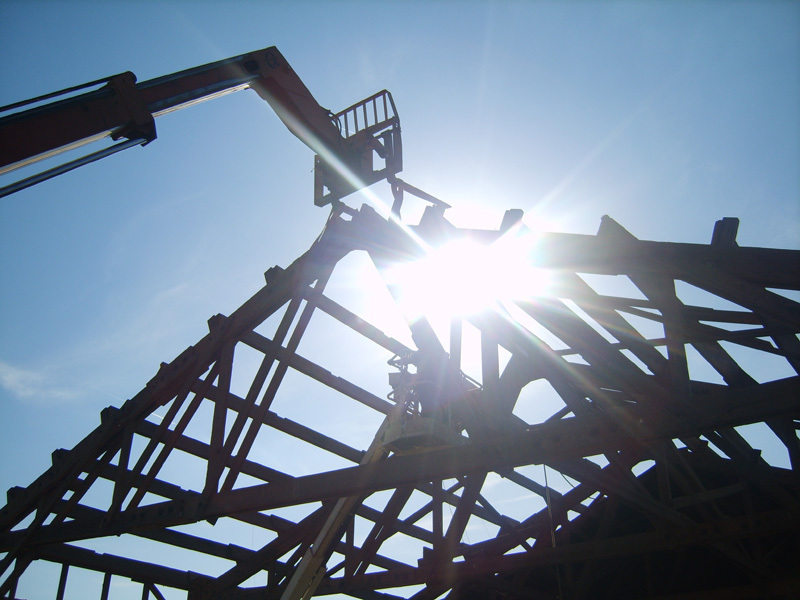 It’s the only building we have ever RE-dismantled. 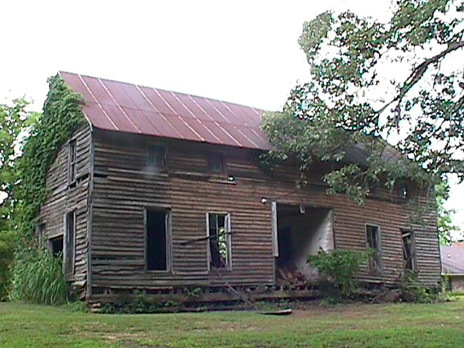 Originally known as Mountain Mills, it was located in Barton, Alabama about 1870. 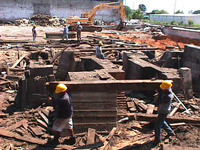 In 1893 the mill was purchased by new owners who had it dismantled (for the first time). 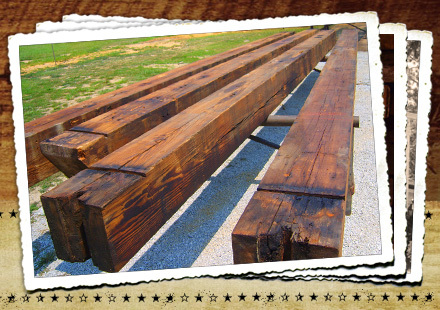 The lumber with its giant beams were loaded on barges and floated down the Tennessee River to East Florence and Re-assembled on Sweetwater Creek. After the relocation, it was incorporated as the Cherry Cotton Mill, named after its principal stockholder Colonel Noel Franklin Cherry. Born June, 1, 1831, he was a son of a wealthy cotton planter from Harden County, Tennessee. The name Cherry is well known to historians of the (UN) Civil War Battle of Shiloh. 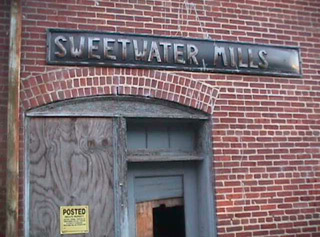 Again, later the Mill changed ownership and was renamed Sweetwater Mill. 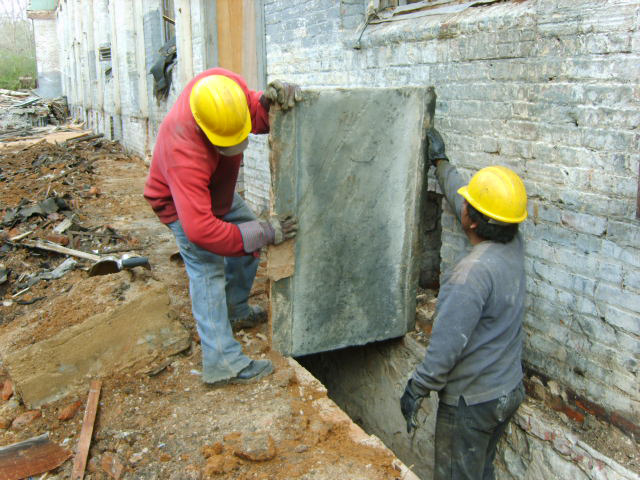 Pennsylvania Bluestone salvaged from aqueduct that water ran through from Sweetwater Creek to supply steam boiler. By 1903, Cherry Cotton Mill had a capacity of 12,000 spindles and employed over 400 people, mostly women and children. Payroll records dated April, 1898 listed a scale of wages ranging from 15 cents to 75 cents per day. This reminds me of one dear lady that came by the job-site and admonished us for destroying one of their historical landmarks. She was truly saddened. I told her this so-called historical land mark had been more like a child labor camp. It had some memories that weren’t so pleasant to remember. I seemed to comfort her a bit by telling her the story of a little 12 year old girl that showed up 15minutes late for her 10 hour shift. The supervisor was mean to her. She was fired… after being slapped. I told her that child labor was common at the Cotton Mills in those days. Children as young as 8 years old worked a full shift. On the lighter side, I must tell a couple of the stories, mostly true, related by different older folks that would drop by while we were taking down the building. They loved to share with me their memories from “back in the old days”. 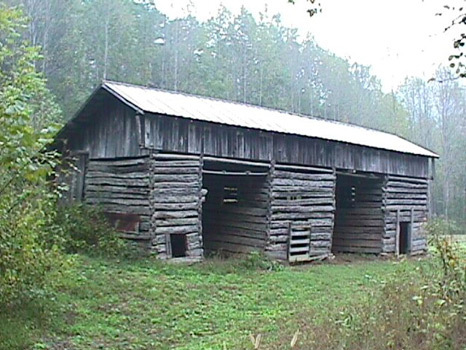 The old Mill had been renamed after the Sweetwater Creek which provided an excellent swimming hole for some of the boys in the area that had rather swim than work at the Mill. Two problems arose from this. Most of the employees on the top (second) floor were girls and the boys in the creek would always go skinny dippin’. I heard this from two of the skindips that came by at different times and pointed up at the window where the girls would gather and watch them swim. I would have questioned their truthfulness but didn’t since they both pointed to the same window. End of story. My favorite story was told by an older gentleman that was working at the mill when Mack and his four mules dropped by and made an offer, (Mack, not his mules) to take down the smokestack that was of no use any longer since switching from steam power to electricity in the 30’s. The deal having been made, Mack rigged up a system on ropes and pulleys that connected to the top and bottom of the 80’ smokestack. How he managed to climb the stack my storyteller could not recall. Mack backed his four mules up and hooked their specially designed harnesses to several ropes that ran through pulleys at the bottom of the stack, up to the top and back down to the ground, then fastened to Macks wagon bed which served as a work platform. With tools on board the platform, Mack stepped on also and begins to talk to his mules. I was all ears as I listened to the old gent who even remembered the mule’s names. There was Muck, Jennie, John, and Jack. I wondered why Muck was so named. Everything ready, Mack wood yell out, “Muck tighten up “Muck wood lean forward on his harness just enough to cause Jennie, John and Jack to lean forward also and then Mack wood holler out, “walk!”. I bet it was truly a sight to see them four mules start walking out away from the stack and pulling Mack to the top as he wood just sit there puffing on his pipe. When almost to the top he would yell, “Halto!”… probably more like, ”Whoa!”. Mack wood get out and walk a circle around the 4 tier brick stack chipping the bricks loose as he went and stacking them on the wooden platform. When the platform was sufficiently loaded it was time again for Mack to talk to his mules that must have looked like dogs a mile away. ”Easy Muck!” Mack wood yell. Muck wood take a small slow step backwards causing the other mules to do the same. In unison they would inch backwards until Mack would holler out, ”Halto!”. Again they would stop and Mack continued to load bricks on. When the weight had reached the limit Mack would crawl over on the platform, light up his pipe and start talking to Muck again, “Easy Muck… Easy”. Them four mules would back up all the way to the base of the smokestack where Mack and his load met them. Repeating the same thing over and over, Mack and his four mules had taken down the Sweetwater Smokestack in two weeks for $1,500.00. This all made sense to me except I was still wondering how Muck got his name. As my history buff was spitting out a huge wad of used up tobacco, I just asked him. “How do you suppose old Muck got his name?” I ask. As he was wiping some juice from his dimples he fired off, “ I didn’t say Muck… I said Buck!" I felt kinda silly but I could understand him better without his chew. That night as I was retiring I just could not get that story off my mind. I could see it as clearly as though I had been there. In a real way, thanks to the new friend I had met, I was there. Before I could sleep, I felt I needed to get something off my heart that was strangely nudging at me so I just knelt beside the bed and prayed, “Lord, help me to trust you... like Mack trusted his mules”. The Tupelo Compress, as it was originally known, was built sometime prior to 1886. An article in the local newspaper dated July of that year makes reference to the company’s president and board members holding a meeting. 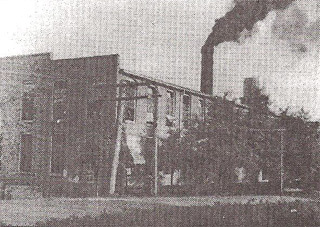 In the news a couple of years later the Tupelo Compress Company was praised for its fair dealings with its customers. People much nearer other compresses would drive further to Tupelo for that reason. For most of its early existence it was a cotton compress, taking in large bales of cotton and compressing them down into a smaller size preparing them for rail shipment. 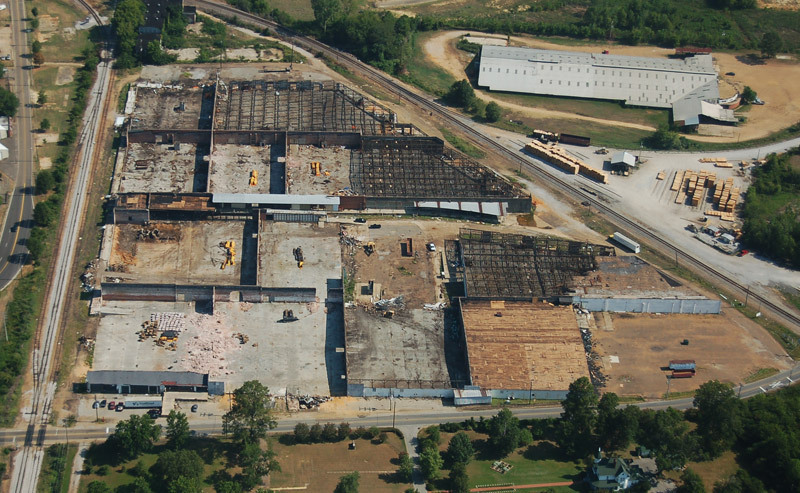 In later years it was to house various warehousing and light manufacturing operations. Our Largest project thus far, this building covered over 10 acres under one roof. A sprawling 460,000 sq/ft placed the maximum demands on a crew of 20-25 men who labored for 5 months before the job was complete. The men divided their responsibilities into three sub-crews. One worked on the roof ahead of two crews on the ground. 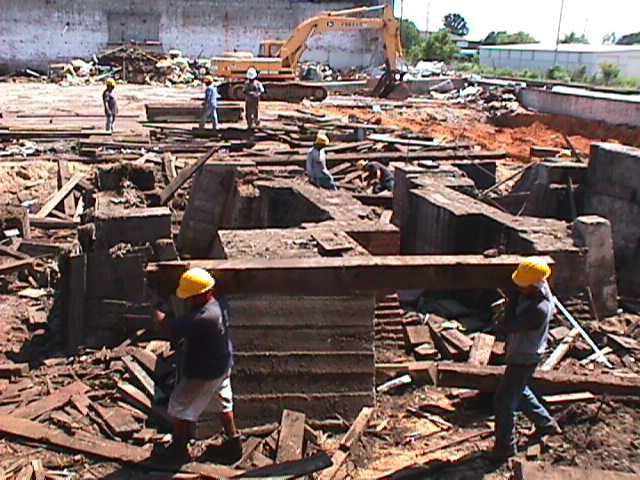 Near the completion of the job they all merged into one large crew salvaging and cleaning the hundreds of thousands of beautiful antique brick. 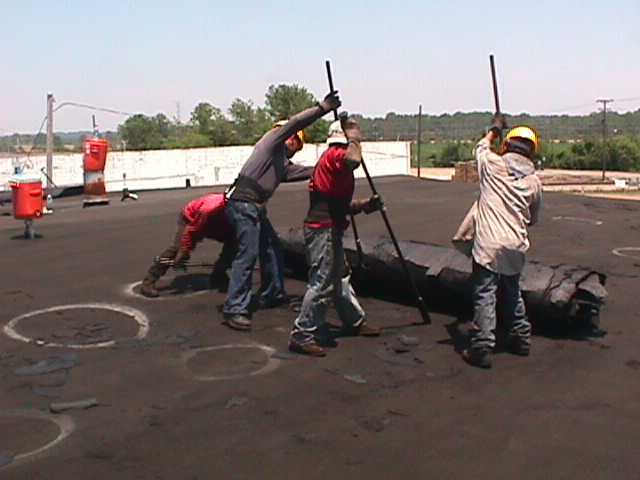 The mammoth job required the removal of over 2 millon pounds of built-up roof tar. 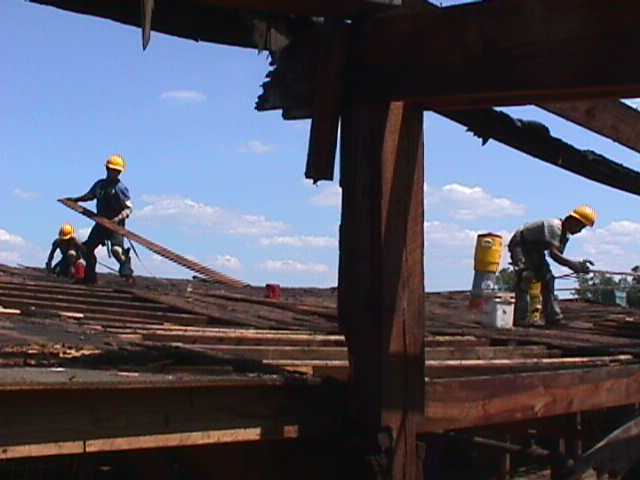 This task was completed by men who knew the secret that a hard day of honest work payed higher dividends than a just days pay ever could. In the background you see the roofing crew's drinking cooler. We had 18 scattered about and our purchashing records of Gator-Aid power mix revealed the men drank over 5,000 gallons during the dismanteling which carried on into July and August. 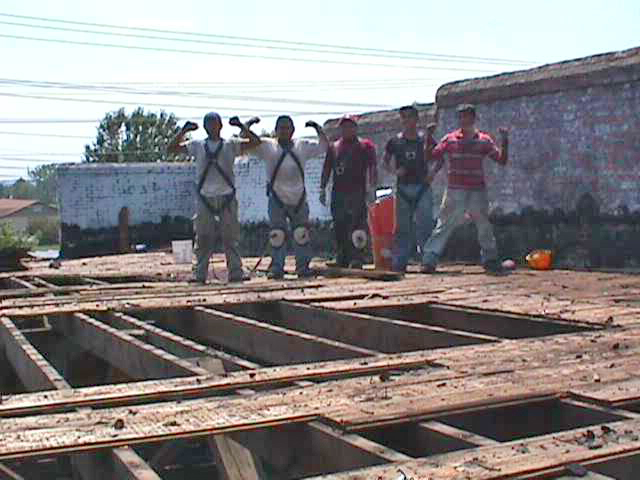 One of the decking crews celibrate atop the last of the 460,000 sq/ft of roof decking they removed in 5 months. 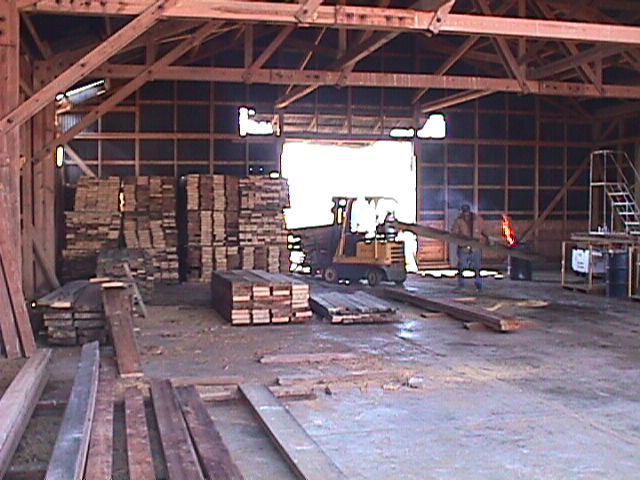 We are still making beautiful furniture, flooring and brick work from the material harvested from this enormous building and shipping it all over the country. Many of our favorite pieces such as (Mama’s Table) are still being handmade by our own in-house craftsmen from lumber harvested from the Tupelo Compress, once located in Tupelo, Mississippi. As with all our projects, we have folks drop by and share with us some of their memories of the times long ago when they worked at the building. A Delightful Beginning… a sad ending. On several occasions, we were reminded what a busy place the Tupelo Compress was in the old days. It was a hub of activity, especially during the 1940’s. A place where you would not want to hang around if you weren’t willing to work. Young men, mostly boys would drop in hoping to find some odd job to pick up a few nickels and dimes, maybe to carry back home and help out their mom who was struggling trying to make ends meet with dad off at war. Twice I was told that one of the regulars was a little boy about 9 or 10 named Elvis. He was one of the favorites to hire for a “shorty” (a job that you should finish in an hour or so for 25 cents) because of his willingness to “shake a leg”. In looking into this story I discovered that Elvis and his mom lived just across the tracks from the compress with his aunt when he was 10. The house stills stands on Maple Street. He lived there a year and half just a few yards from the compress and it was always known, Elvis loved helping bring in a little cash for his mom who was going through tough times along with many others in those days. One day I took a walk from the Maple Street house to the old cotton compress. It took less than 10 minutes since it was only a block away. As I stood there looking back toward Maple Street, I felt assured that Elvis did spend a lot of time at the Tupelo Compress, working at whatever a 10 year old boy could find to help out his mom whom he loved so dearly. One day while we were working on the building, I was making my rounds ahead of the men as I would regularly do looking for situations I thought they should be aware of. I came into a room stacked with a few old boxes. Being the kind of book hound that I am, I never pass up and opportunity to ramble through old boxes in hopes there may be a discarded jewel just waiting for me. 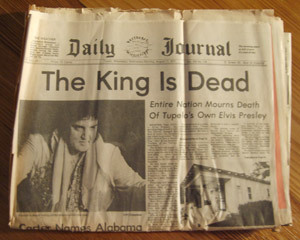 In one of the boxes I uncovered a local newspaper dated August 17, 1977. My heart sank with sadness at the irony of what I had found. 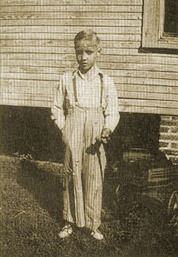 Just that day, I had heard one of the stories of Elvis looking for work to help out his mom back in the 40’s. Now, 60 years later I find his obituary in the same building. The little 10 year old boy who, willing to help out and surly warming the heart of his mom, had grown to be a man, warming hearts all over the world. 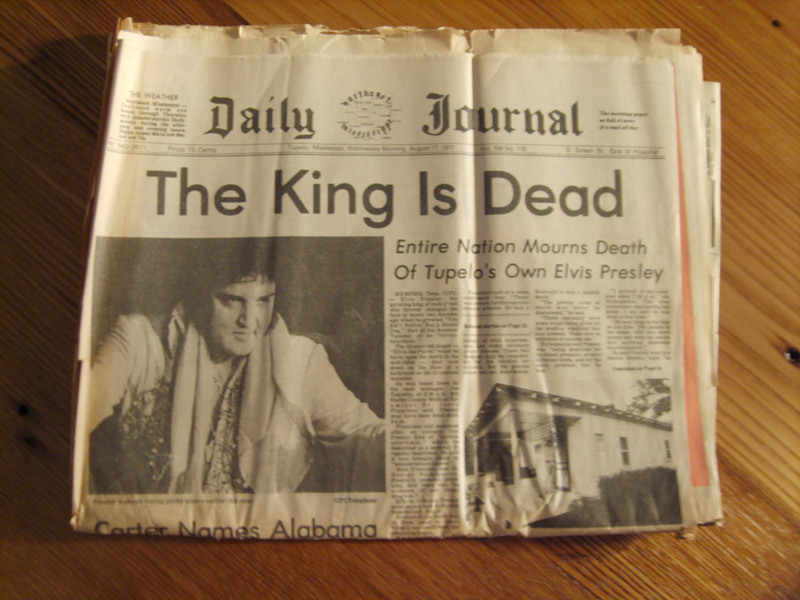 After reading and tenderly folding the paper under my arms, there in the dim light of the room I knelt and breathed a prayer of thanks for I too felt that I had been warmly touched by Elvis’s life in a special way.